Free when you spend over £50 at bitebackpublishing.com and politicos.co.uk! Politicos.co.uk is pleased to introduce Election 2017: The Results map, which will be available just a few days after the election on 8 June! This unique A1-sized wall map will give you an at-a-glance breakdown of all the constituencies in Great Britain, and their political allegiances following the 2017 general election. It will also offer a box-out of London constituencies post election, and national information on the vote percentage for each, the seats won and voter turnout. 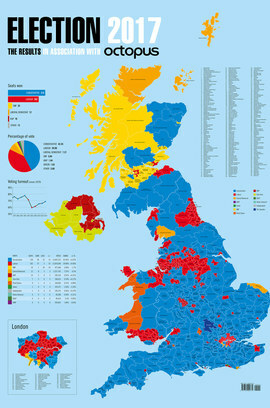 An indispensable wall map for those working in and around Westminster, political anoraks, students and general observers of British politics alike.